We have been on many, many safaris ourselves so can assure you accommodation that suits your personal requirements and tastes. 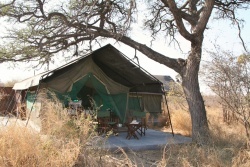 We have been to every camp we recommend ourselves - at last count this was 67 lodges! Most lodges and camps have six to ten separate, double or twin rooms. All have ensuite bathrooms, with hot and cold running water available on tap. Some have air conditioning, other use fans. Rooms are spacious and have their own private deck or verandah. Most have pools - some have a plunge pool for each room. Rooms are connected via pathways to a communal living and dining area, with bar and library. All are utterly comfortable and stylish, thoughtfully located in special settings, and guest safety is paramount. Lodges tend to be built of stone or wood, with thatched roofs, and are permanent structures. Camps are constructed of strong canvas tents, built on solid or raised foundations, under a second roof, usually of thatch. Though permanent structures, they are built using the concept of a ‘light footprint’, with minimal impact on the environment. Bathrooms are en-suite with hot and cold running water on tap. The design aim is pure luxury. These are a simpler version of a permanent tented camp, though usually without a pool. They are taken down during the rainy season, when the area is most likely to be inaccessible due to seasonal flood waters. The design aim is utter comfort. 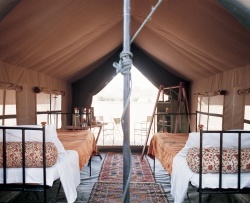 Sturdy canvas tents are set up in private locations, especially for your safari. 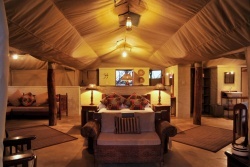 Most often these are in the classic East African style, though dome tents may be used on walking and canoeing safaris. Bathrooms are usually ‘en-tent’. You can experience the wonder of a warm bucket shower, filled with hot water on demand, and you will most likely have a flush toilet. On specialist walking and canoeing safaris bathrooms and loos may be shared. We will discuss your requirements with you in depth, and you will know exactly what to expect. Any surprises will be delightful ones! The design aim is comfort and adventure. 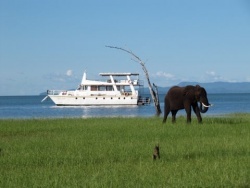 On large bodies of water, such as Lake Kariba in Zimbabwe, and the Chobe River in Botswana, you can live aboard a comfortable houseboat, spot game from the decks, take trips on small tender boats to fish or view game really close up, or use a vehicle to view game further inland. The design aim is utter comfort. We will design a safari where you can enjoy a variety of locations, settings, wildlife and experiences. Contact us to discuss your requirements.